Click image above to open interactive map. 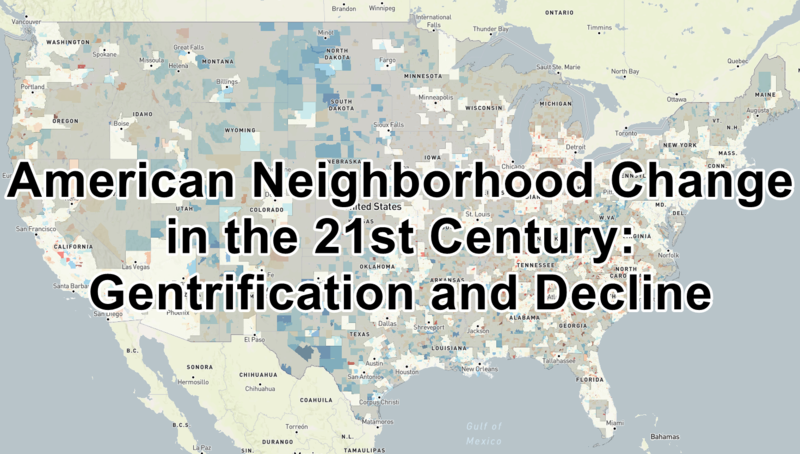 American Neighborhood Change in the 21st Century is a detailed analysis of neighborhood economic expansion and decline across the United States. It develops a new method for measuring how American regions, cities, and neighborhoods are growing, shrinking, and getting poorer or richer over time. It quantifies, on a nationwide and local basis, the degree of economic growth, low-income displacement, low-income concentration, and neighborhood abandonment. It compares these trends across different geographies, in order to produce a comprehensive look at America’s evolving cities. The most common form of American neighborhood change, by far, is poverty concentration. About 36.5 million residents live in a tract that has undergone low-income concentration since 2000. At the metropolitan level, low-income residents are invariably exposed to neighborhood decline more than gentrification. As of 2016, there was no metropolitan region in the nation where a low-income person was more likely to live in an economically expanding neighborhood than an economically declining neighborhood. Low-income displacement is the predominant trend in a limited set of central cities, primarily located on the eastern and western coasts. Los Angeles and Washington, D.C. have the most widespread displacement. On net, far fewer low-income residents are affected by displacement than concentration. Since 2000, the low-income population of economically expanding areas has fallen by 464,000, while the low-income population of economically declining areas has grown 5,369,000. White flight corresponds strongly with neighborhood change. Between 2000 and 2016, the white population of economically expanding areas grew by 44 percent. In declining areas, white population fell by 22 percent over the same span. Nonwhite residents are far more likely to live in economically declining areas. In 2016, nearly 35 percent of black residents lived in economically declining areas, while 9 percent lived in economically expanding areas. The Executive Summary lays out the goals and topline findings of the report. The Full Report includes discussion of the methodology used in this study, and comparative tables that show exposure to neighborhood change across regions. The Appendices contain a number of tables comparing effects of neighborhood change across different metros, divided into 24 separate population subgroups. More details about metro-level neighborhood change can be found in downloadable reports below. Each report includes comprehensive tables about the effects of changes on population subgroups within the metro, as well as its central cities and suburbs. The reports also include finely detailed maps depicting change at a census-tract scale.